Scotland isn’t for everyone, but I’m going to go out on a limb and say, it is for me. After you read my post, you may decide it’s for you too. Or you may just think, well that was nice to read, but I’m still not going, ya hear! Fair enough. My husband and I decided to take a more adventurous fall trip this year. We just got married and did the whole lay on the beach thing for our honeymoon. 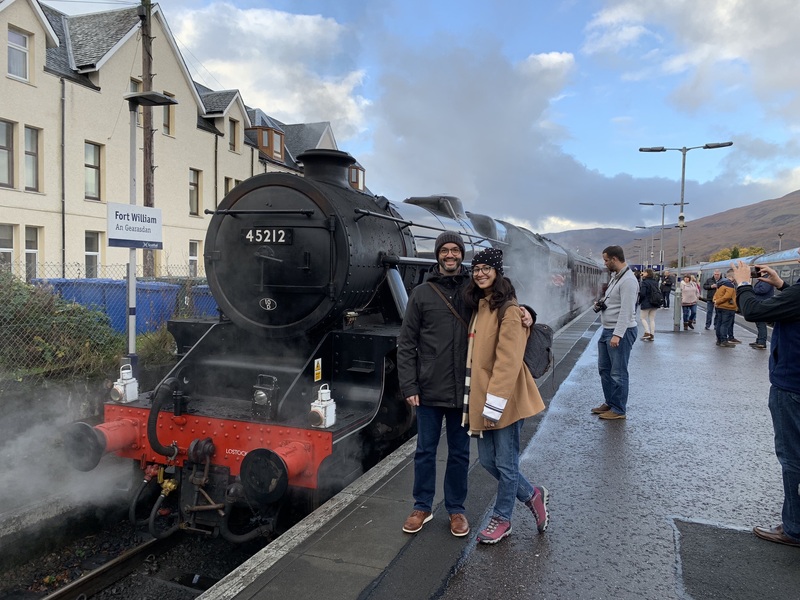 I definitely still had the travel bug and after speaking with my “travel guru” Marisa, with the help of tour company Celebrated Experiences, we landed on Scotland in October. 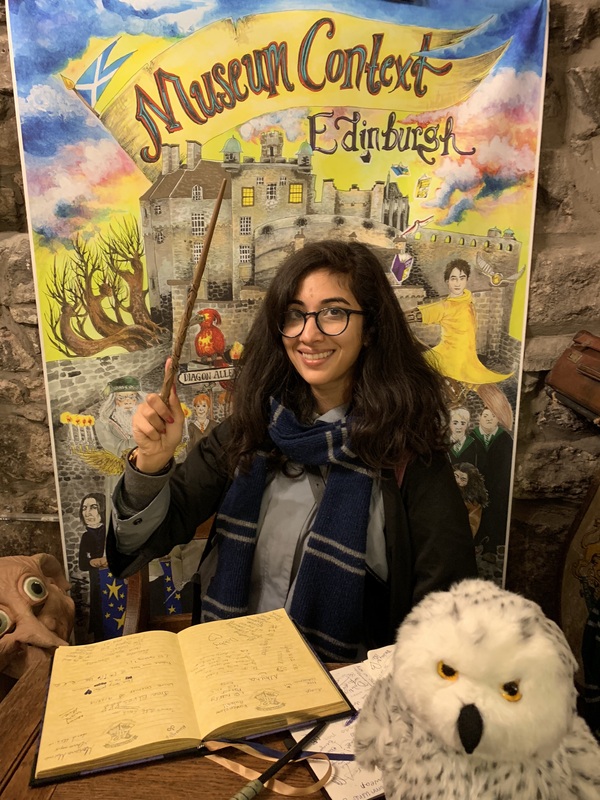 It was perfect for both of us – I could visit as many Harry Potter filming sites as possible and my hub could taste all kinds of scotch – win win. We were expecting an overall dampness throughout our trip, and we were mostly pleasantly surprised by what we got. Don’t get me wrong, it rained, but not all day. The worst weather we encountered was at the beginning of our trip in Edinburgh. During the day it was foggy and wet, but at night it was completely clear. Tip from a local: locals don’t really use umbrellas because the wind is so strong, they don’t really help. Instead, invest in a good waterproof jacket with a hood and sturdy shoes and you should be good to go. What a magical city. Such beautiful buildings, great food and wonderful people, filled with transplants and locally born folk. As Marisa suggested, we stayed at The Principal Hotel in Charlotte Square and it was a place that felt both vibrant and young, while having history to back it up all at the same time. The spa here is worth a visit. Because of the rain and fog, we skipped Arthur’s Seat, though we heard great things. The fog made the view at Edinburgh Castle completely obstructed but we had a lovely time checking out all the crown jewels. Pro Tip: buy your tickets in advance to skip the line. After leaving the castle, we wandered down Victoria Street and had a blast here, from spending way too much time in the Harry Potter stores (there are two) to investing in tweed purchases at Walter Slater (something Scotland is definitely known for). We made sure to include rest and relaxation during our trip so as not to get overwhelmed. After taking in a nap or a steam, we would grab dinner and then head to a pub for drinks on Rose Street. After two days in Edinburgh, it was time to explore the lower highlands. On our way to Blairgowrie, we stopped over in a couple of towns in Fife. The first, Anstruther, was a cute fishing village town with, you guessed it, INCREDIBLE fish & chips. The dog game in this village was ON POINT. Really an idyllic setting. Next, we hit up the university town of St. Andrews. You know, the one that the Royals attend. This was a freaking beautiful day with blue skies, so it made our stop over all the more better. 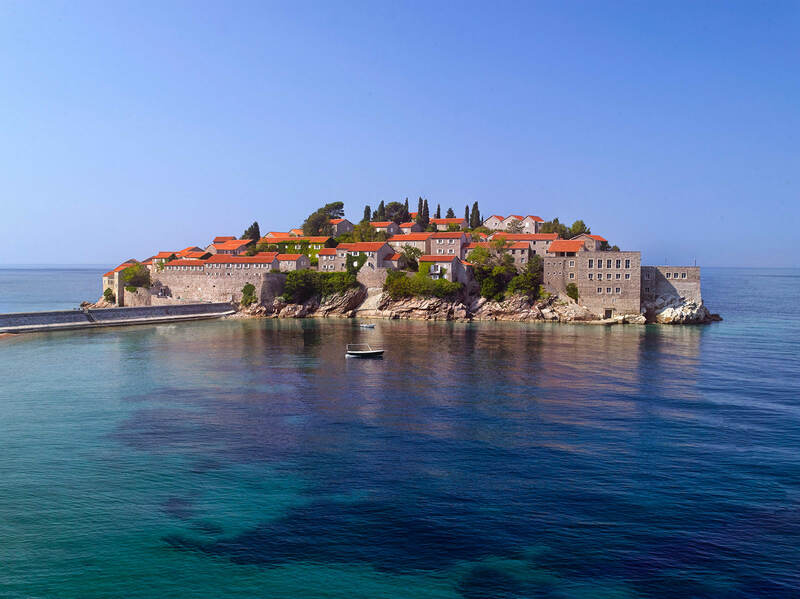 We took in some great architectural sites from the castle to an incredible jetty and then finally the university itself. We caught an orchestra practicing for a few minutes – just what we needed. 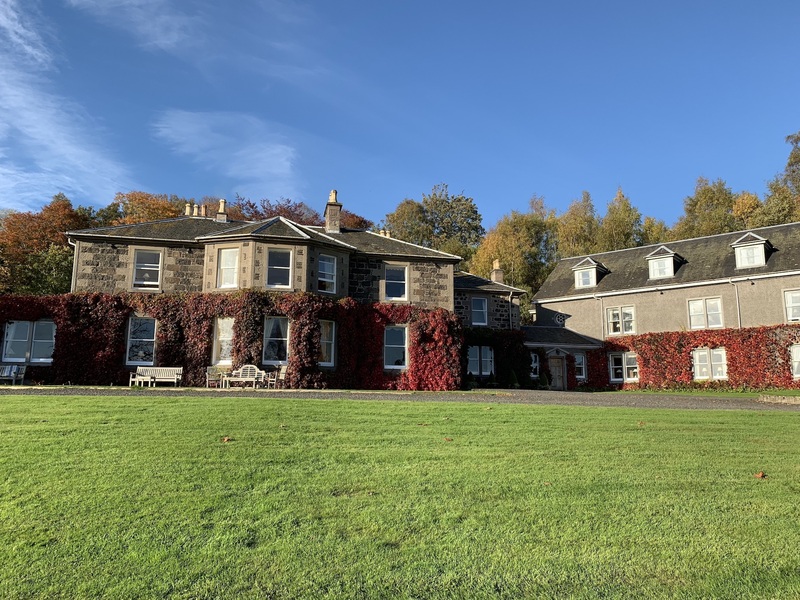 We checked into the Kinloch House (of the Relais & Châteaux hotels) and were pleasantly delighted. Since we were essentially staying at an estate, Paul, (the butler? Valet?) greeted us at our car, and brought our bags, and us, straight to our room. The team also parked our car for us. We didn’t have to do anything – no check in, no “can I see your passport and take a credit card?” All places should do check in like this. The look and feel of the Kinloch House is exactly what you’d hope for in a stay at the Highlands. Very cozy and refined. I didn’t know those two things could go together, but somehow, they make it work. We started our evening in the parlor for a pre dinner drink and chatted up the other guests, including a lovely older couple named John and Carol, who were there for their anniversary. We pre-ordered our meal and when we were ready, we went into the main dining room for a decadent three course meal. We shared a whole bottle of red, and a meal that included lots of cheese and red meat. 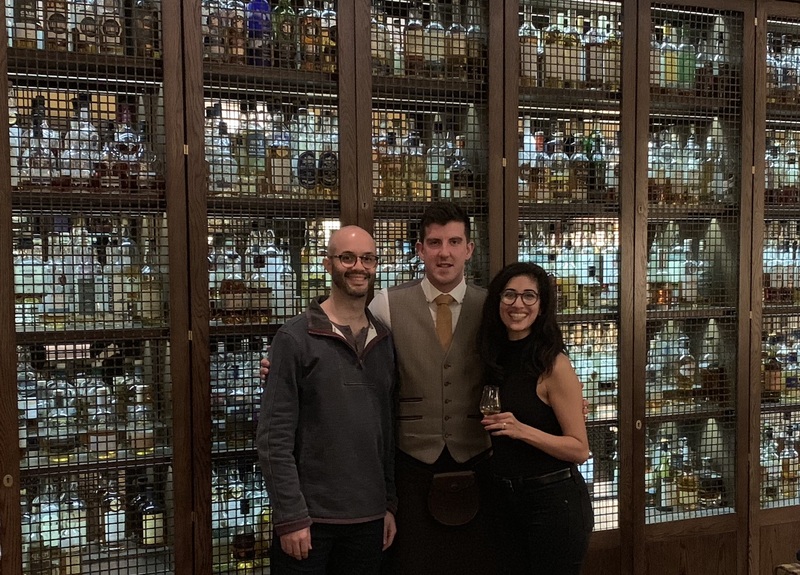 We then closed out the night by doing a whiskey tasting with Paul. Needless to say, I over indulged due to all the excitement. This completely took me out of the game the next day and we were unable to visit the largest park in Great Britain, The Cairngorns National Park. This delighted my husband who loves the simpler things in life. He read two, count em two, newspapers from cover to cover while drinking a refreshing beer and gulping down fresh carrot ginger soup. Meanwhile, I was dying and couldn’t eat anything. It happened to be the nicest day of the week and we didn’t even need to wear jackets. I was not going to waste this day, so I spent my time laying on the grass in front of the lodge, staring at the cows and horses, while the lodge staff stared at me. Sometimes, you can’t always be go go go, and you just need one day to just do absolutely nothing at all. This was the perfect place and day to do this. Fort William was the stop for me. 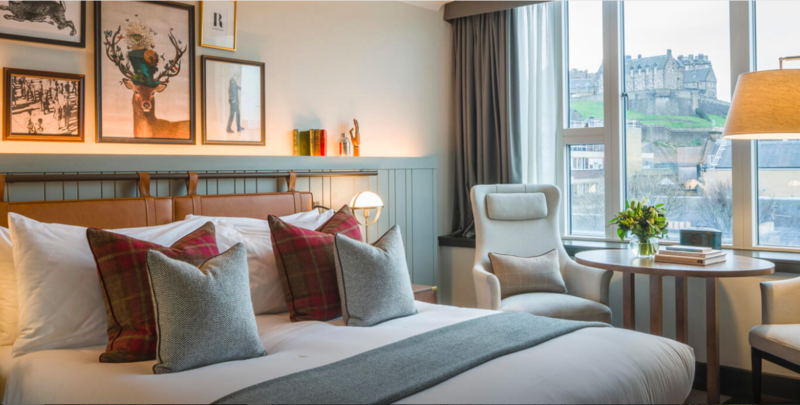 As a TV and movie nerd, it has been home to many a film setting, from Skyfall and Braveheart to Harry Potter – the reason we picked this location. There are so many sights to see here, from the Ben Nevis mountain and a 15 minute gondola up to Aonach Mor. Getting here was the best part. We savored every landscape view and sweet smell because we knew we’d likely never come here again. 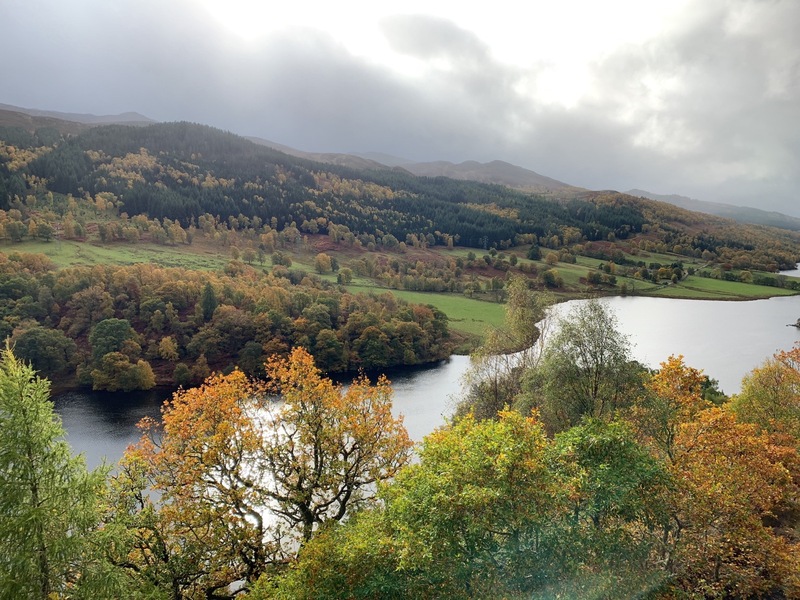 We stayed at the family run Corriegour House, overlooking Loch Lochy, which is just super fun to say. There were things we loved about the experience. It had a lot of character and the staff, James and Ian mainly, were delightful.  Similar to Kinloch, there was no check-in process – brilliant! Though the room had an incredible view of the lake and was very spacious, it had a smell of old lady perfume mixed with dampness. The bathroom was so small, it felt like I was on a boat. The water pressure left me with the same feeling too. 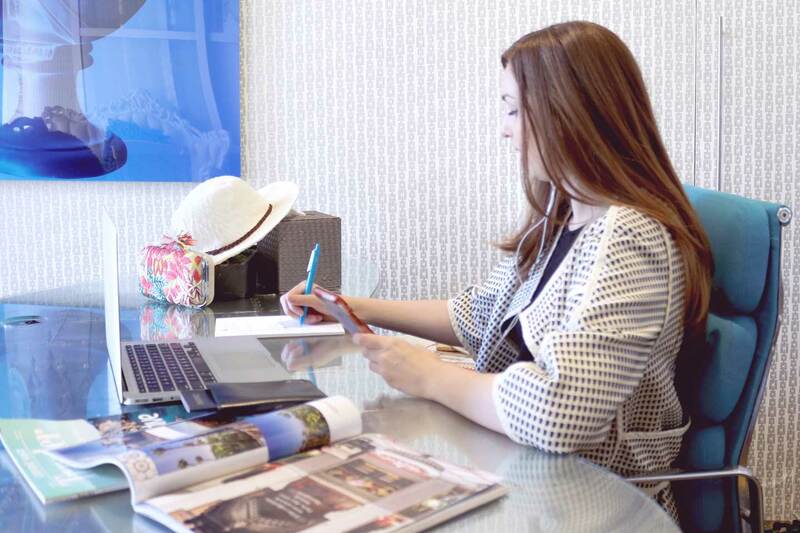 We offered our feedback to Marisa, our Virtuoso travel advisor, and within minutes, the Corriegour staff addressed the issue. We felt a bit awkward about it, but we were happy in the end because they were just so accommodating. They moved us to a new, room the next day, no problem; one that had a much better “loo” situation and one that didn’t smell like great-grandma (no offense to great-grandmas out there). It didn’t have as good of a view or wasn’t as big, but we were happy! The staff also offered us free drinks, which we happily drank in the parlor. All in all, we were very pleased with our experience here! The most scenic of pit stops, where we drove through colorful fall foliage and more types of terrain than I can count. I’ll get into the highlights of Glencoe more in the food and Harry Potter sections below, but needless to say, we effing loved it. After Glencoe, we journeyed to the Trossach’s National Park for a dreamlike, albeit windy, drive. Prior to reaching the park, we stopped over at the Green Welly, which was more than just a service station. They offer lots of last minute trinkets and treasures to bring home, from Harris Tweed products to cherry jam and shortbread. After the drive, we headed to Doune. Getting to see where the pilot version of Game of Thrones’ Winterfell was a highlight I’ll never forget. We reached our final destination after a super loopy doopy drive. My husband was very much out of it. We stayed at The Bonham Hotel. Marisa and the team at Celebrated hand picked the rooms so I’m not sure if we got upgraded or not, but the room was ENORMOUS. They made sure we had a gorgeous living area and free drinks to boot. They even gave us a “wee” dessert to try. The restaurant was a resounding “meh” but we were happy all around. Greyfriar’s Kirkyard Cemetery – not too far from Victoria Street is the cemetery that resulted in some pretty recognizable character names like, McGonagall and Tom Riddle. It takes some time to find, so either apparate on your own to find it or go on the tour as they point it out. ‍The Elephant House: grab a tea or coffee here which is apparently the birthplace of Harry Potter. It can get crowded, so you can take your drink or pastry on the go. Pop into the WC to check out HP quotes and scribbles! 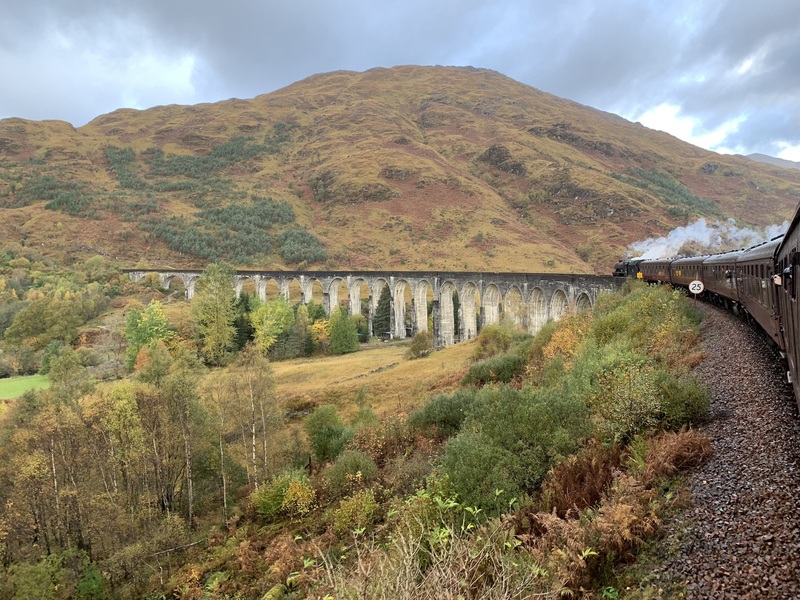 The Jacobite - Steam Train: go on the exact journey Harry, Ron, Hermione and the rest of the students took on the actual Hogwarts Express. You’ll take in views of the Glenfinan Viaduct, Loch Eilt and Shiel – all seen in the movies! Also, the last stop, Malaig, is GORGEOUS. You can see the tip of Isle of Skye from here AND there’s a tiny HP gift shop called Haggard Alley for you to browse through. Pro Tip: it may be tempting to sit in first class but try and sit in the second class – you get a better view of the front of the train and the windows fog up less. Make sure to bring a tissue or cloth to wipe the windows so you can see better. On your way out, the best seats are on the left side on the way out and the right side on the way back, both facing in the direction of the train. Treat yourself to some afternoon tea and/or champagne for sure! There’s a cart that sells tea, coffee and drinks as well as some chocolate frogs! Do yourself a favor and book way in advance. I booked about 3 months prior. Steall Falls: iconic waterfall seen in in The Goblet of Fire, home of the Tri Wizard Tournament. This is a super doable, wonderful hike. The photo opps are for sure on point. 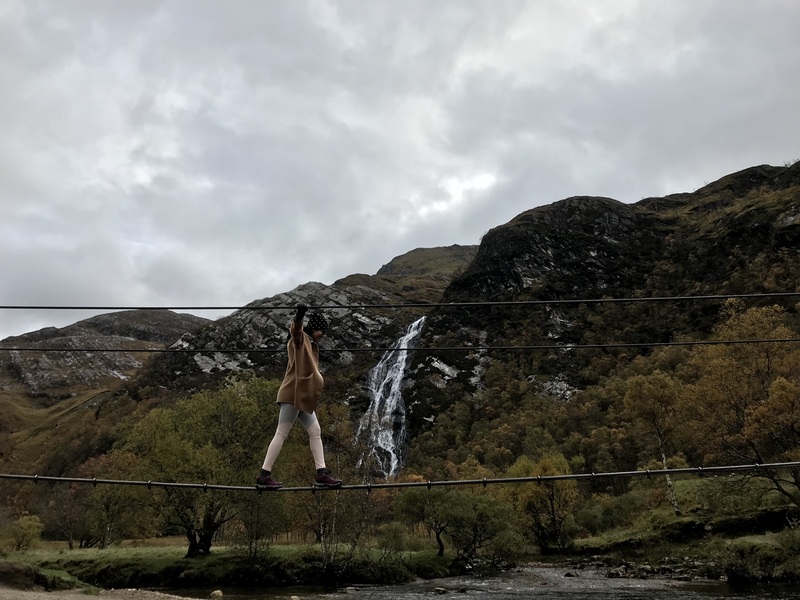 Walk the tight rope or skip stones – there’s plenty to do once you reach the falls. It’s about a 45 minute hike each way. This was probably the favorite part of our trip. Hagrid’s Hut: finding this location can be easy to miss, but once you find it, you’ll know you’re there. “If you have to ask, you’ll never know, if you know, you need only ask…” Ok, sorry about that. Park your car at the Clachaig Inn and walk to your left a few hundred meters (whatever that means). If you see the “loch,” you’ve gone too far. There’s a dirt path on the right that leads you up. You’ll see a flat grassy area with a view of the loch to the right of it and that’s where Hagrid’s hut was located. Pro Tip: Google maps reviewers gave some descriptive directions so definitely use that if you get lost! Nikita Welcomes You to Edradour! I hated Gin and Tonic before I tried this Gin. Do yourself a favor and try all their gins, there are so many flavors! A light beer, but not light in color. Very refreshing and the go to for me! Before heading into the Trosachs National Park, stop over to buy a few bottles of your favorite whiskey and gin. They also get in some great rare investment pieces every once in a while at reasonable prices so give them a try! 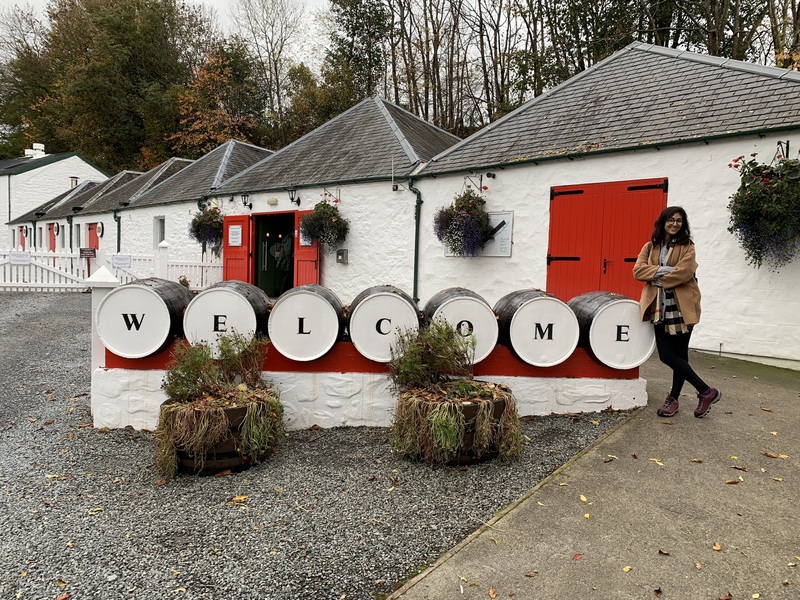 For a pop in: Dalwhinnie Distilleries – though they have tours too, you can come here and get a great vibe just from talking to the people that work there. It sits in the Cairngorn’s National Park. It gets very windy up there because it’s the highest distillery in Scotland. The Cafe Royal: this place feels like it has history. Grab a seat at the bar and imbibe in a drink, whatever you fancy! We were told food in Scotland was not good and we were pleasantly surprised by how amazing it was…you just have to be prepared for it. Things close early: we pretty much missed the boat to visit almost all the castles we wanted to see because they close around 4pm. I also couldn’t get into Strathberry, the store that sells bags Meghan Markle wears, because they close at 5pm and aren’t open on Sundays. I’ve never slept better than on my trip to Scotland. Maybe it was the quiet ambiance that us New Yorkers are not used to. Haggis isn’t as bad as it sounds and neither is black pudding! If you'd like to plan your own trip to the Highlands and Edinburgh, get in touch today at marisa@desalviotravel.com.